Enter Ocasio-Cortez. She supports expanding Medicare to people under 65, what’s known as single-payer or Medicare-for-all. But the big question is how to pay for all that health care. According to an estimate from the Urban Institute, the price tag on Sen. Bernie Sanders’s Medicare-for-all proposal would be $32 trillion over 10 years. Maybe the Pentagon has a few trillion dollars lying around somewhere, as Ocasio-Cortez implied? Let’s find out. Ocasio-Cortez claimed on Twitter that $21 trillion in “Pentagon accounting errors” could have paid for 66 percent of the Medicare-for-all proposal. Her tweet references an article in the Nation, a left-leaning magazine. The specific line about the missing $21 trillion comes from research by Mark Skidmore, an economics professor at Michigan State University. Skidmore contends that the Pentagon has competent personnel and is no more complex than a large multinational corporation, which makes the trillion-dollar accounting gaps all the more puzzling. Regardless, in the situation Skidmore is describing, the $21 trillion is not one big pot of dormant money collecting dust somewhere. It’s the sum of all transactions — both inflows and outflows — for which the Defense Department did not have adequate documentation. “The same dollar could be accounted for many times,” as Philip Klein wrote in the Washington Examiner. Skidmore’s paper clearly talks about Pentagon “assets” and “liabilities.” This key distinction was duly noted in the Nation article that Ocasio-Cortez referenced on Twitter. To be clear, Skidmore, in a report coauthored with Catherine Austin Fitts, a former assistant secretary of the Department of Housing and Urban Development who complained about similar plugs in HUD financial statements, does not contend that all of this $21 trillion was secret or misused funding. And indeed, the plugs are found on both the positive and the negative sides of the ledger, thus potentially netting each other out. But the Pentagon’s bookkeeping is so obtuse, Skidmore and Fitts added, that it is impossible to trace the actual sources and destinations of the $21 trillion. But it did not appear in her tweet, which clearly implied that the $21 trillion could have been used to pay for 66 percent of the $32 trillion in estimated Medicare-for-All costs. “To clarify, this is to say that we only demand fiscal details [with health and education], rarely elsewhere,” Ocasio-Cortez said in a follow-up tweet. That’s not the argument coming through in her original tweet, which has been retweeted by nearly 25,000 users. Most people reading the tweet are likely to take its flawed comparison at face value. It’s also worth pointing out that Skidmore’s total covers 17 years (1998 to 2015), whereas the Urban Institute’s $32 trillion estimate for Sanders’s Medicare plan covers 10 years. So the two numbers are not apples-to-apples to begin with. The Pentagon is working to fix the accounting gaps, Sherwood added, "by reducing the labor needed to manually enter the Journal Vouchers and reducing the time it takes to perform research” for account reconciliation. Let’s put $21 trillion in context. The entire national debt is $21.8 trillion. According to the Congressional Budget Office, total defense spending from 1998 to 2015 was nearly $9 trillion. The CBO estimates $7 trillion in defense spending from 2019 to 2028. In other words, completely defunding the military for the next decade would yield only one-fifth of $32 trillion. That’s a much better way of illustrating the cost of Medicare-for-All. That’s a direct comparison. It’s badly flawed. The same article she referenced on Twitter would have set her straight. The tweet is still up, probably causing confusion. 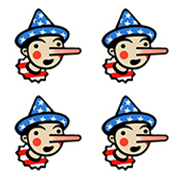 So we will award Four Pinocchios to Ocasio-Cortez. "$21T in Pentagon accounting errors. Medicare for All costs ~$32T. That means 66% of Medicare for All could have been funded already by the Pentagon."